History Buffs: Check out this Town of Jupiter announcement! 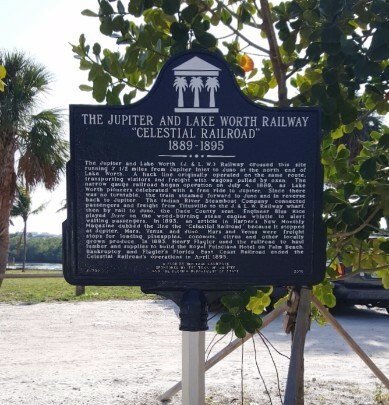 Public and press welcome to attend the dedication ceremony for the Celestial Railroad’s official historical marker!On February 22, 2017, the Town of Jupiter will hold a ceremony to dedicate the Florida Historical Marker for the Jupiter and Lake Worth (J. and L.W.) Railway, also known as the “Celestial Railroad.” The railroad was categorized as an official Florida Historical Landmark in 2010. The J. and L.W. Railway began operation on July 4, 1889, and traveled the seven and a half miles from Jupiter Inlet to Juno at the north end of Lake Worth. The line carried both passengers and freight cargo, replacing a wagon route that used oxen for transporting people and goods. The railroad was nicknamed the “Celestial Railroad” in an 1893 article in Harper’s New Monthly Magazine due to its stops at Jupiter, Mars, Venus and Juno. The dedication ceremony will take place at the Inlet Village Marina at 5:00 p.m. on February 22. Public and media are welcome to attend. For more information, please contact Kate Moretto, Town of Jupiter, 561-741-2575 or katem@jupiter.fl.us. Copyright © 2017 Town of Jupiter, All rights reserved.